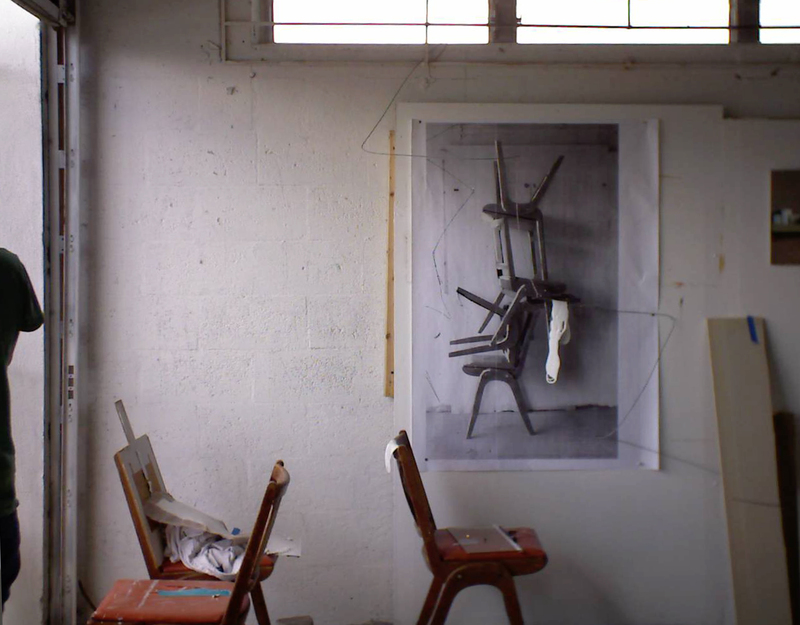 The studio is both source and location. As I get older it seems that the subject or narrative of the painting is inseparable from the place of making. The particular light, mood and geometry of the room offer up opportunities to find compositions. Even when working on an idea born outside of the space, the atmosphere and objects within become part of the process just as the paint and brush do. The studio then works as material. It is an important part of my practice. 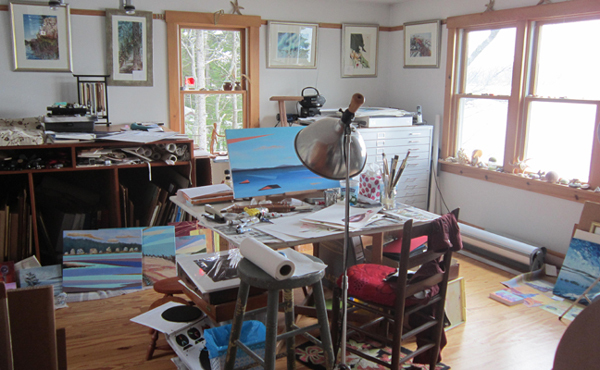 My small, second floor studio accesses North light on one side and an aerial view of Muscongus Bay on the other. A center work table and portable easels accommodate both moving light and spot lights. Against one wall stands a large framing table with under-counter storage, and double stacked flat-files. Against the opposite wall stand floor to ceiling bookshelves for art books and supplies. High moldings enable me to hang works in progress as well as finished work. This dedicated space provides retreat in which to create. Currently, I’m working on a series I call geometric realism. 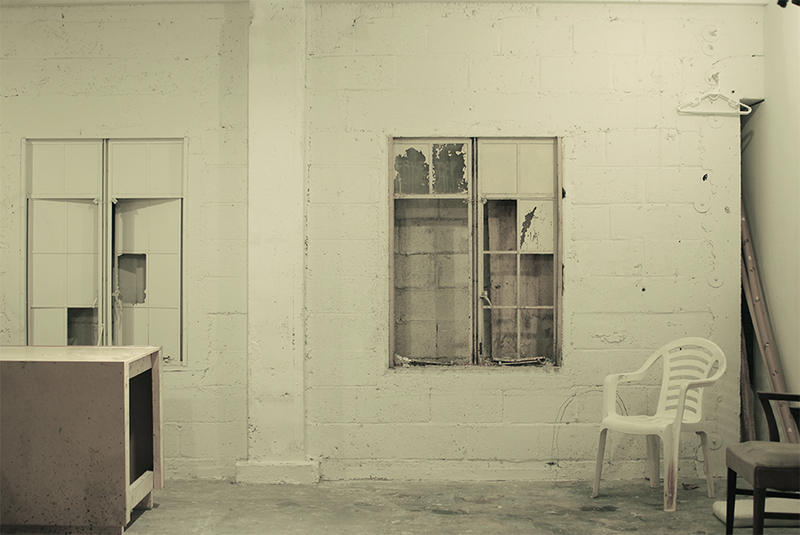 This is a night shot, studio lit up, waiting for a visitor. On the moving wall, photos I’ve taken and printed using my drawings with objects from the studio set up front of them. 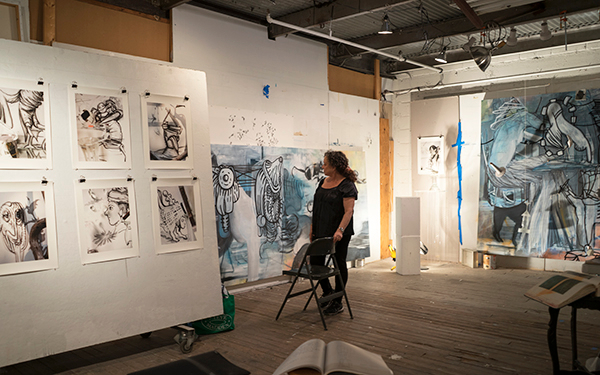 Behind me, a 2 paneled, 10 feet wide diptych in oil on canvas and another painting in progress. Also shown, is a book, to the right, a large scientific text that I work in as a journal. A future project I’m thinking about will use photos of the spreads in this book that I’ve manipulated with drawing and paint.